New cars nowadays have a lot of sound deadening materials to make the car quieter inside. The downside is it removes the visceral engine noises you hear as you mash the gas pedal and listen to the pistons move faster and faster. Car companies have sought different methods of piping engine noises into the car cabin, including using the stereo. 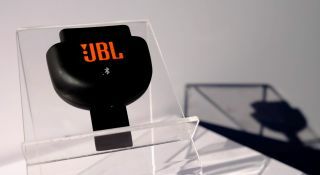 JBL wants to let everyone listen to engine noises through the car stereo with a new dongle that plugs into the onboard diagnostic port (OBD-II) – the JBL Throttle. The $49 dongle uses the OBD-II connector to read the vehicle's throttle input and matches it to the custom engine sounds. A companion application, which JBL did not have available to demo, lets drivers select what kind of engine they want their car to sound like, from a high-revving 4-cylinder to a powerful V8. The dongle has to pair with the car stereo via Bluetooth to work, which means Bluetooth has to be the selected audio source every time. The Throttle doesn't hijack your car's Bluetooth connection completely, for car stereos that can only pair with one device at a time. It provides a pass-through so you can connect your phone to the Throttle dongle, which then connects to the stereo so you can stream music from your phone and have the engine sounds through the car speakers. While the JBL Throttle sounds silly, at $49, it'd make a great stocking stuffer next Christmas or a gag birthday present. I'm not a fan of engine sounds being piped through the car speakers, but the thought of someone in a Toyota Prius or Nissan Leaf rolling through town with the windows down and V8 engine sounds coming from the speakers is amusing to me.